Construction figures used in this report are based on CMHC, RCAF and USAF reports which are issued at various times from the middle to the end of the month preceding the Pinetree Report. Due to the time lag involved in the transmittal of information from the sites and time used in compilation, construction figures noted in Pinetree Reports may be behind the actual work by three to six weeks. Baldy Hughes (Site 20) began interim operation 30 Apr 53 using temporary TPS-1D facilities. Eight USAF interior of Canada sites are now carrying on interim operation. Sites 10 (Ramore), 14 (Pagwa), 15 (Armstrong), 16 (Sioux Lookout), 17 (Beausejour), 19 (Puntzi Mountain), 20 (Baldy Hughes) and 21 (Saskatoon Mountain). RCAF Sites 1 and 2 (Mont Apica and Lac St. Denis) have been carrying on limited operations since Jul 52. (i) - Tie Lines: - A list of circuits either in service or now available is included in this report. The list has been compiled from communications company reports as follows: Bell Telephone Co. of Canada, Feb 53; Canadian Pacific Telegraphs, 8 Apr 53; Canadian National Telegraphs, 8 May 53; British Columbia Telephone Co. Ltd.,30 Apr 53. Also included are a few lines reported by RCAF sites. Phase 1 - Lac St. Denis - St. Hubert - In operation. Expanded facilities in operation 15 Jun 53. Phase 2 - Foymount - St. Hubert - Initial installation to be completed by 15 Jun 53. Phase 3 - Mont Apica - St. Hubert - Installation of first phase to be completed by 15 Jun 53. Phase 4 - Edgar - St. Hubert - Initial installation to be completed by 15 Jun 53. Phase 5 - Falconbridge - St. Hubert - Installation to be completed less 1 relay station 1 Jul 53. Phase 6 - Senneterre - St. Hubert via Falconbridge - Installation estimated to begin 1 Jul 53. Phase 7 - Parent - St. Hubert via Falconbridge - Construction estimated to begin 1 May 53 but delayed one week. No permission from AFHQ to construct. Phase 8 - Parent - St. Hubert via Mont Apica - Construction estimated to begin 1 May 53 but delayed one week. No permission from AFHQ to construct. Site 3 - Foymount - To be completed 15 Jun 53. Site 4 - Edgar - To be completed 15 Jun 53. Site 5 - Chatham - Engineering 85% completed. Site 7 - Parent - Estimated complete 15 Jul 53. Site 8 - Senneterre - Interim installation to be completed 15 May 53. Site 9 - Falconbridge - To be completed 15 Jun 53. Lac St. Denis - (Site 2) - Main radar complete and operating. Foymount - (Site 3) - AN/FPS-3 installation completed. Acceptance flight tests completed. Ready for RCAF take-over. ISG-98 installations completed. Acceptance flight tests to commence after acceptance of Site 9. System tests being performed. Edgar - (Site 4) - AN/FPS-3 installation completed. Acceptance flight tests completed. Ready for RCAF take-over. ISG-98 installations practically completed. System tests run through. Flight tests to commence after take-over of Site 9. Chatham - (Site 5) - AN/FPS-3 installation not started. ISG-98 installations to commence 25 May 53. Parent - (Site 7) - AN/FPS-3 installation completed. 85% of test specification carried out. 72-jour run scheduled for first week of May. 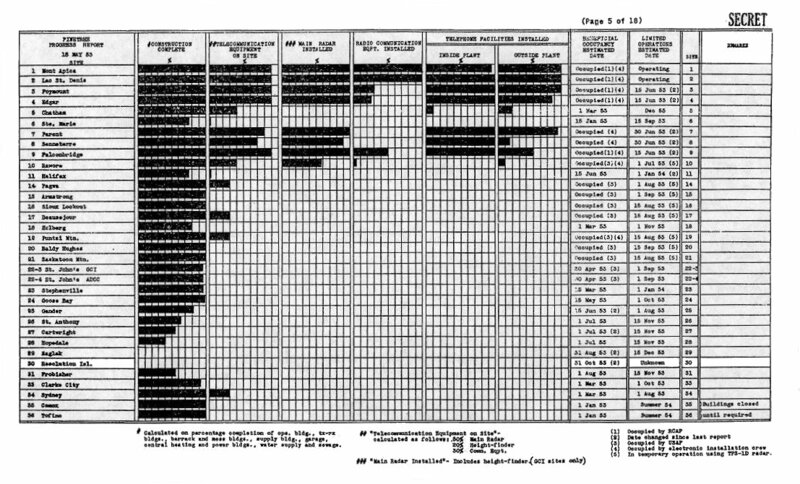 Flight tests scheduled for 11 May 53. ISG-98 installations complete and system tests finished. Senneterre - (Site 8) - AN/FPS-3 installations completed. Not yet flight tested. ISG-98 installations 805 COMPLETED. Should be finished 31 May 53. Falconbridge - (Site 9) - AN/FPS-3 completed. Flight tests completed. Ready for RCAF take-over. ISG-98 installations completed except for a few lash-up cables and awaiting flight test reports. Sydney - (Site 34) - One shipment of AN/FPS-3 radar components shipped to site 23 Mar 53. Second load shipped 13 May 53. Ramore - (Site 10) - Installation of AN/FPS-3 radar was started 20 Apr 53 and was reported 58% completed by 4 May 53. Since pressurizing and de-icing equipment is not yet available the antenna has been installed without a radome. It will be necessary to dismantle part of the antenna when the radome is erected at a later date. Three loads sent to site. Pagwa - (Site 14) - One shipment of AN/FPS-3 radar received on site 27 Mar 53. 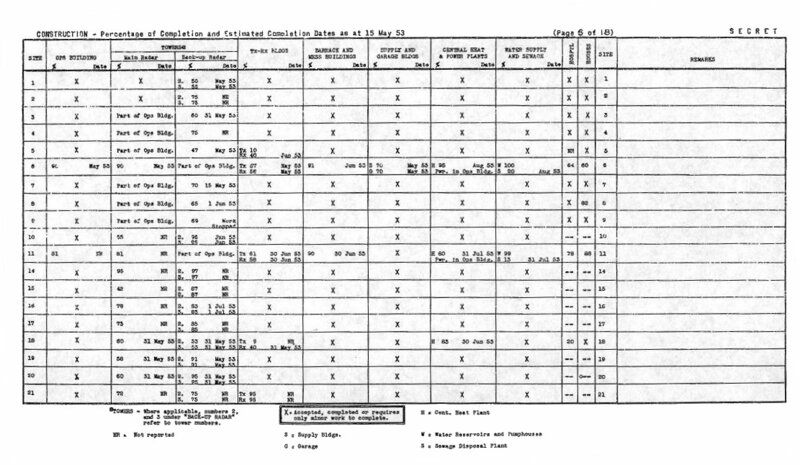 Second load shipped 12 May 53. Beausejour - (Site 17) - Sending of installation crew to site is being held up until arrival of equipment. First shipment of AN/FPS-3 radar was shipped 8 May 53. Puntzi Mountain - (Site 19) - First shipment of AN/FPS-3 radar received and assembly in progress. No further remarks to Report No. 9 dated 15 Apr 53. Matrix showing showing progress at radar sites. Matrix showing construction progress at radar sites. Pages 8 to 18 of 18 are missing.